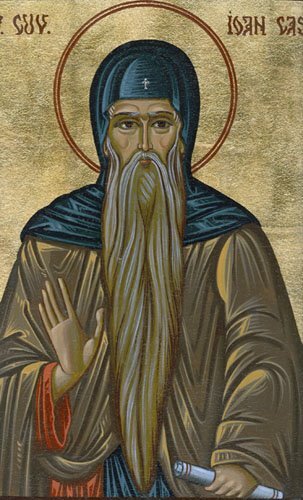 St. John Cassian: A clear rule for self-control handed down by the Fathers is this: stop eating while still hungry and do not continue until you are satisfied. . . .
“A clear rule for self-control handed down by the Fathers is this: stop eating while still hungry and do not continue until you are satisfied. When the Apostle said, ‘Make no provision to fulfill the desires of the flesh’ (Rom. 13:14), he was not forbidding us to provide for the needs of life; he was warning us against self-indulgence. Moreover, by itself abstinence from food does not contribute to perfect purity of soul unless the other virtues are active as well. Humility, for example, practiced through obedience in our work and through bodily hardship, is a great help. If we avoid avarice not only by having no money, but also by not wanting to have any, this leads us towards purity of soul. Freedom from anger, from dejection, self-esteem and pride also contributes to purity of soul in general, while self-control and fasting are especially important for bringing about that specific purity of soul which comes through restraint and moderation. This entry was posted in Sayings from Saints, Elders, and Fathers, St. John Cassian and tagged Anger, Chastity, Fasting, Greed/Avarice, Hunger, Kingdom of Heaven, Lust, Moderation, Passions, Pride, Purification, Purity, Self-Esteem, Self-Indulgence, Soul, Spiritual Labors, Spiritual Reading, Spiritual Tools, Vigils on June 16, 2014 by ocqadmin. St. John of Kronstadt: . . . Do not help the Devil to spread his kingdom. . . .
You see very clearly that it is extremely difficult, and without God’s grace and your own fervent prayer and abstinence, impossible, for you to change for the better. You feel within yourself the action of a multitude of passions: of pride, malice, envy, greediness, the love of money, despondency, slothfulness, fornication, impatience, and disobedience; and yet you remain in them, are often bound by them, whilst the long-suffering Lord bears with you, awaiting your return and amendment; and still bestows upon you all the gifts of His mercy. Be then indulgent, patient, and loving to those who live with you, and who also suffer from many passions; conquer every evil by good, and, above all, pray to God for them, that He may correct them—that He may turn their hearts to Himself, the source of holiness. Be zealous of the fulfillment of His will on earth, as it is in heaven. Forgive them that trespass against you with joy, as a good son rejoices when he has a chance of fulfilling the will of his beloved father. This entry was posted in Sayings from Saints, Elders, and Fathers, St. John of Kronstadt and tagged Conquering Evil, Despair, Disobedience, Forgiveness of God, Forgiveness of Others, Fornication, God as Father, Goodness of God, Greed/Avarice, Kingdom of God, Loving Neighbor, Mercy, Mercy of God, Neighbor, Overcoming Sin/Passions, Passions, Prayer, Pride, Repentance, Sloth, The Evil One on February 28, 2014 by . St. Justin Popovich: In them [the Lives of the Saints] it is clearly and obviously demonstrated . . .
By the same token in the Lives of the Saints there are very many marvelous examples of how a youth becomes a holy youth, a maiden becomes a holy maiden, an old man becomes a holy old man, how an old woman becomes a holy old woman, how a child becomes a holy child, how parents become holy parents, how a son becomes a holy son, how a daughter becomes a holy daughter, how a family becomes a holy family, how a community becomes a holy community, how a priest becomes a holy priest, how a bishop becomes a holy bishop, how a shepherd becomes a holy shepherd, how a peasant becomes a holy peasant, how an emperor becomes a holy emperor, how a cowherd becomes a holy cowherd, how a worker becomes a holy worker, how a judge becomes a holy judge, how a teacher becomes a holy teacher, how an instructor becomes a holy instructor, how a soldier becomes holy soldier, how an officer becomes a holy officer, how a ruler becomes a holy ruler, how a scribe becomes a holy scribe, how a merchant becomes a holy merchant, how a monk becomes a holy monk, how an architect becomes a holy architect, how a doctor becomes a holy doctor, how a tax collector becomes a holy tax collector, how a pupil becomes a holy pupil, how an artisan becomes holy artisan, how a philosopher becomes a holy philosopher, how a scientist becomes a holy scientist, how a statesman becomes a holy statesman, how a minister becomes a holy minister, how a poor man becomes a holy poor man, how a rich man becomes a holy rich man, how a slave becomes a holy slave, how a master becomes a holy master, how a married couple becomes a holy married couple, how an author becomes a holy author, how an artist becomes a holy artist. . . This entry was posted in Sayings from Saints, Elders, and Fathers, St. Justin Popovich and tagged Anger, Drawing to God, Evil, Faith, Faith in God, Falling Down Getting Up, Goodness of God, Greed/Avarice, Joy, Lives of the Saints, Lust, Overcoming Sin/Passions, Passions, Pride, Repentance, Resurrection, Saints, Sinner, Spiritual Death, Suffering, Transforming into a Saint on February 4, 2014 by .